Germany's Federal State North Rhine-Westphalia is home to some of the country's most important cities in terms of tourism and economic output. Cologne, Düsseldorf, Essen, Dortmund and the industrial hot spot of the Rhine-Ruhr area are all located in North Rhine-Westphalia. A camping holiday in a LUX-camp based in this part of the country allows holidaymakers to explore not just some of Germany's greatest urban tourist attractions, but is also ideal as a base for discovering the delightful Central Uplands (Mittelgebirge) and the Lower Rhine region. Interested to find out more? Then reserve your mobile home in a North Rhine-Westphalia LUX-camp without delay! Why book a camping holiday in North Rhine-Westphalia? a Rhine River tour is an unforgettable experience: your kids will see more castles in one day than anywhere else in the world! 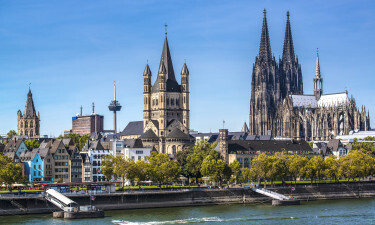 Take a day to explore Cologne's tourist attractions, not forgetting to stop off at the famous Köllner Hofbräu Früh for a glass or two of "Kölsch" lager, or head to Aachen, a city brimming with medieval monuments, museums, theatres and concert halls. Like cycling? Your LUX-camp is surrounded by wonderful cycling trails. 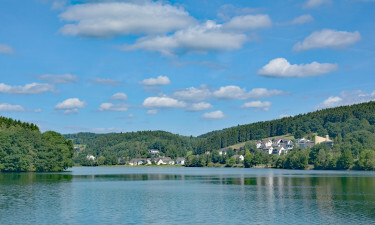 Spend an afternoon along the River Lippe, take the historic ferry across and walk or bike to the town of Dorsten, a 750-year-old gem with many attractions. Located at a body of freshwater and surrounded by woodland, the luxury camping site offers families a wealth of leisure activities and amenities onsite. Secluded and surrounded by outstanding natural beauty, the holiday camping sites boasts two children's playgrounds, a sports field, table tennis and swimming pool. Nearby is the Moviepark attraction and campers can include movies in their mobile home rental package if they wish. The LUX-camp also has its own restaurant. The luxury camping site is located directly by a body of freshwater and has a pool area and safe paddling pool for children. The area is ideal for hiking, swimming, cycling, climbing and skating. There are no beaches, but plenty of opportunities to go hiking in the foothills of the Mittelgebirge. Cycling along the River Lippe, located close to the holiday campsite, offers relaxation and family-fun, as well as a chance to explore nearby attractions like 12th-century Castle Lembeck, one of Germany's famous "Wasserburgen" (moated castles). 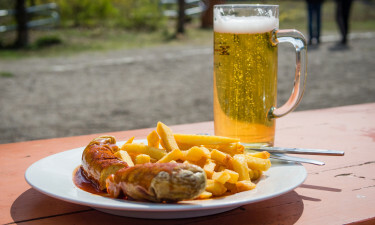 Curry Wurst is Germany's national dish and it's served everywhere, even at the luxury holiday camping site's own restaurant and snack bar, although you're more likely to be served pancakes, the chef's speciality. Camping luxury should always include an onsite restaurant so you have the choice, whether to cook in your mobile home or "eat out" onsite. Visit the city of Münster near Aachen - its Old Town is a stunning blend of medieval and Renaissance architecture and the City Hall is one of its gems. In Cologne visiting the cathedral is a must-do on tourists' itineraries, but so should be the lovely half-timbered buildings in the little town of Monschau or the moated Castle Nordkirchen.